The support of family and friends is very important to the healing process. 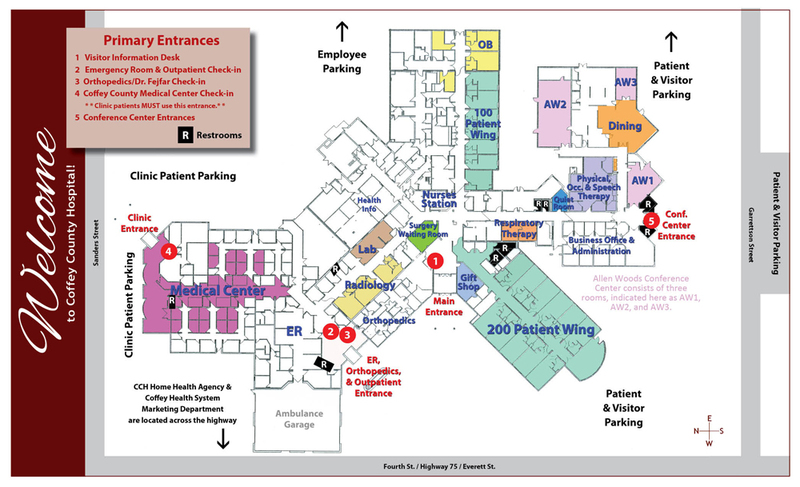 We welcome your visit to Coffey County Hospital. Visiting hours are from 2-4 p.m. and 7-8:30 p.m.
Click here to download the visitors' map to your computer. we kindly offer the following tips. 1. For your health and that of our patients, the Coffey County Hospital campus is a tobacco-free. Thank you for your cooperation. Insist that healthcare providers do the same. Clean your hands after sneezing; coughing; touching your eyes, nose, or mouth; after using the restroom; and before and after eating and drinking. Cover your cough or sneeze with a tissue or your sleeve. Do not sit on patient beds—even unoccupied beds—or handle equipment. Please do not visit if you are sick or have had ill symptoms within the last three days including nausea, vomiting, diarrhea, fever (or feeling feverish), uncontrolled cough, or rash. Most hospitals prohibit flowers in intensive care units. If you change the water in a vase of flowers, be sure to wash your hands afterward. The patient may be on a special diet or the food could spoil and make the patient sick. Don’t let kids play on the floor or bed. Have them wash their hands as they enter and leave the room. Make sure children are free from symptoms of infection (e.g., runny nose, sore throat, rash, cough, etc.). Talk to a nurse before entering a room with posted "Isolation Precautions." You may need to wear a mask or other protective clothing. Limit the patient’s personal items. Less clutter eases the critical job of cleaning hospital rooms. Keep items off the floor and away from waste containers. If you are visiting multiple patients (for instance, if you are a pastor), sanitize your hands before and after each visit. Do not share the communion cup. Lay the communion wafer on a paper towel (not directly on the patient’s table). Visit the person in isolation last and follow the precautions specified.